PA1-8X24SFP-ACSS-5.56 is protected by the Primary Arms Lifetime Warranty. If a defect due to materials or workmanship, or even normal wear and tear, has caused your product to malfunction, Primary Arms will either repair or replace your product. Primary Arms does it again! We took our popular 1-6x variable scope back to the lab, and the engineers crammed in even more magnification. Now it’s a 1-8x! Look through it and you’ll find the patented ACSS® reticle combining bullet drop compensation, wind holds and moving target leads in one easy to use system. The second focal plane design is simple and strong. The ACSS reticle stays the same size regardless of power setting, so you'll need to crank it up to 8x magnification to use its advanced features. 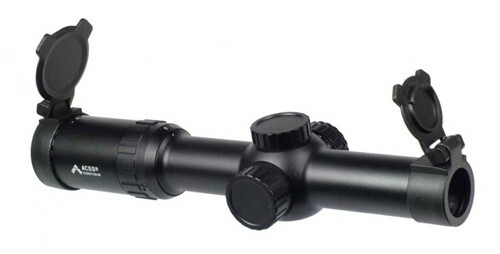 This scope is very fast and instinctive from 0 – 300 yards, and very precise from 300-800 yards. The brightness knob on the left side of the tube illuminates the center reticle through 12 brightness settings using the included CR2032 battery. This tough scope is waterproof, fog resistant, and covered by the Primary Arms Lifetime Warranty. Flip up caps are included, and a “cat tail” scope lever is available from 3 Gun Stuff (product code GS-460).